We introduce our print edition revamp. 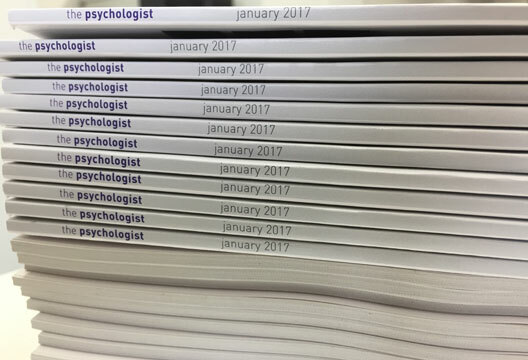 If you are a member of the British Psychological Society, in a week or so you should receive your copy of the 'new style' Psychologist in the post*. We think it represents more than a superficial change, so here we outline some of the thinking behind it. In a dizzying couple of years, we have redeveloped both The Psychologist and Research Digest websites, launched apps, produced a regular podcast and branched out into live events. It’s important that we reach out to diverse audiences in new ways, but we have been left with a nagging sense that we have neglected those Society members who still like to hold The Psychologist in their hands, sit down with a cup of tea or flick through it on the bus. So this is a relaunch for them, the print lovers. In addition to a new size and higher production values, we have introduced new formats and are attempting to transition to a different style of writing. Overall, we are aiming for a quality, professional, calm, assured, tactile, engaging reading experience. We set out on this path after careful consideration of reader surveys, along with much discussion at our Editorial Advisory Committee. A comment in one of those surveys said: ‘it seems more of a magazine than anything’. Yes – we believe that magazines matter (and in the January edition, our journalist Ella Rhodes will look at why). We are proud to be one. We really want to hear what you think of the new magazine. Email, write, call, pop round… or share your views and photos on Twitter @psychmag using the hashtag #PsychReborn - anyone doing so between now and the end of the year will be entered into a prize draw to win a ticket to a live event (see below: terms and conditions apply). If you haven't featured in our pages, do consider contributing. More than ever we need writing that can engage and inform our large and diverse audience, and our supportive process can bring you great rewards. This is not the end of our journey - we will never stand still. But it does seem like a good opportunity to express our appreciation for all those who have helped us along the way… my small put perfectly formed staff team, our readers and contributors, and The Psychologist and Digest Editorial Advisory Committee and Associate Editors past and present. If you are not a member of the British Psychological Society and therefore don't receive The Psychologist, and all this talk makes you wish you did, then you should definitely look at joining. There are various grades, including Student, and Affiliate for those who do not have applicable qualifications. For this month only, you can view an open access digital edition of the magazine to see what you are missing. Finally, any relaunch deserves a celebration, and we are currently planning a very special live event for the Spring: The Psychologist Gets Physical. Watch this space! *Please note that if you have only joined the Society very recently, January may not be the first issue you receive. Terms and conditions: This event may or may not happen. If it doesn't, we'll find some other prize laying around the office, some books or something. If it does, one person who tweets some feedback or a picture of them with the January edition - @psychmag and using the hashtag #PsychReborn – will win a ticket to it. You'll have to cover any travel and accommodation I'm afraid. Editor's decision is final and all that. Brilliant. Love the feel and texture. Love the layout and the magaziny presentation. Illustrations look much better. Only problem is the print colour. Lilac! Much more difficult to read than black. Takes more energy and determination to interpret and think about, particularly on a moving bus. Brilliant. Love the feel and texture. Love the layout and the magaziny presentation. Illustrations look much better. Only problem is the printed words. Lilac/blue on off-white paper. Much more difficult to read than black. Takes more energy and determination to interpret and think about, particularly on a moving bus. Can we opt out of receiving a paper copy? Now BPS has such a great App, is it possible to help save the environment and not receive a paper copy of the Psychologist? Opt out of a paper copy.